A number of people mentioned The Velveteen Rabbit and there were even a few titles that I wasn’t familiar with and had to look up. Too bad I don’t have a little one to read to anymore. My not-so-little one and I used to read together all the time and he loved a couple of the same books I always liked. 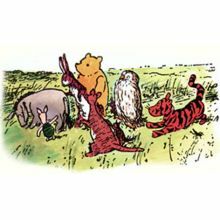 I love the original “Winnie-the-Pooh in the Hundred Acres Woods” stories. They were always some of my favorites and I loved Shepard’s drawings and the way Milne told the stories. I was also always found of the Curious George stories too. We made sure to buy both collections when Sean was born and we would read them to him all the time. As I got older and read more on my own, I always liked the Hardy Boys stories and Encyclopedia Brown. I liked the adventures they would get involved in and how they would go about trying to solve mysteries. I would have to say that all of those stories were my favorites as a child. I am so glad to see that Sean shares the same passion for reading that Michelle and I share. He always has a book with him and often gets in trouble at school for reading something while he should be doing other classwork, but I am okay with that. If that’s the worst thing he gets in trouble for, than that is good. He and I read all The Mysterious Benedict Society books together, all of the Percy Jackson books together and the books by Pseudonymous Bosch in “The Name of This Book is Secret” series. He even had a few while I was hospitalized in a coma that he didn’t finish because he wanted to finish them with me. I couldn’t be prouder of how much he likes to read, although he is more into the fantasy works now than I was at his age, but Michelle loves the same type of books as Sean does, so it’s no surprised he wants to read them. They often share the same books with each other. What is the one book you’ve read recently or are reading now that you would recommend to someone? I know I have a big pile of books next to my bed, in the living room and a backlog of books on my Nook that I haven’t gotten to yet, so I have a lot to choose from. Maybe you’ll recommend one of my books in waiting so I can start on that one first. So what’s something you’ve read or are reading now that you recommend? Something that keeps you wanting to read, not putting the book down until it’s done? It can be any book you want, no topic is off-limits, it just has to be something you really enjoyed recently and would want to share with others. Think about it and let me know. You can answer on here, or on Facebook or on Twitter. I’ll also post the question to some people on Twitter and see how they answer. I’ll post my answer tomorrow. That’s it for right now. I have to pick up the dog from the groomers, get Sean ready for a party tonight, get a recipe for dinner tonight, start the laundry, clean the stove and get some work done, so my Monday is pretty full. A quick thanks to those who read my last installment of “Below the Surface.” Hopefully you’re enjoying it and I should have the next installment up this week. If you haven’t read any of it and would like to, you can start with the first installment, then the second, and yesterday was part three. I am trying to finish that one up so I can start on a new one I have had some ideas for so I may be concluding that one soon. Anyway, enjoy the rest of your day, enjoy whatever you are reading (and please share it with us all!) and don’t forget to do something creative today! @IguanaFlats Celestine Prophecy, is one of my favorites! @IguanaFlats Gone Girl by Jillian Flynn. @IguanaFlats just finished Gone Girl. Loved it.